Q From James MacNaughton: I’ve been told that the man who gave rise to the term Spoonerism never said one. Can this possibly be true? A The legends, mischievous inventions and simple errors that have accreted around the term obscure the truth. But there is evidence to suggest that the Reverend William Archibald Spooner rarely if ever uttered a Spoonerism. 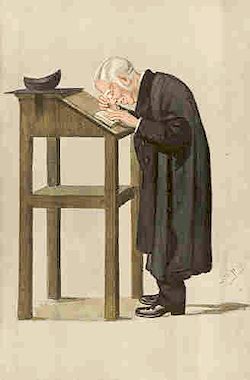 Spooner spent all his adult life at New College, Oxford, joining it as a scholar in 1862 and retiring as Warden (head of college) in 1924. The term Spoonerism began to appear in print around 1900, though the Oxford English Dictionary records that it had been known in Oxford colloquially since about 1885. He is said to have asked his neighbor [at lunch] to have “some of this stink puff”, pointing to an ornamental dish of pink jelly. In chapel it is recorded that he has read out the first line of the well-known hymn which starts “From Greenland’s icy mountains” as “From Iceland’s greasy mountains”, and has spoken of the wicked man whose words were “as ears and sparrows”. Virtually every example on record, including all the famous ones, is an invention by ingenious members of the university who, as one undergraduate remembers, used to spend hours making them up. Spooner did transpose items, but not like this — his inversions were more often of whole words or of ideas rather than sounds. A reliable witness records him repeatedly referring to a friend of a Dr Child as “Dr Friend’s child”. One day he passed a woman who was dressed in black and told his companion that her late husband was a very sad case, poor man, “eaten by missionaries”. He did things backwards sometimes. One story — well attested — recounts how he spilled some salt during a college dinner and carefully poured some claret on it to mop it up, a reversal of the usual process. He is also said to have remarked on the poor lighting of some stairs and then to have turned off the lights and tried to lead his party downstairs in the dark. Spooner was very well known in the small community of Oxford. He was instantly recognisable, since he was an albino, with the pale face, pink eyes, poor eyesight, white hair and small stature that is characteristic of his type. (Some writers have suggested his verbal and physical quirks may have been linked with his albinism, perhaps a form of what is now called dyspraxia.) Spooner later became famous for his verbal and conceptual inversions, so it’s easy to see how his name could have become linked to products of undergraduate wordplay. This seems to have been from affection rather than malice, since Spooner (known as the Spoo) was kindly and well-liked. Spooner was an excellent lecturer, speaker and administrator who did much to transform New College into a modern institution. But he was no great scholar, and it’s a cruel twist of fate that he is now only remembered for a concept he largely had foisted upon him.